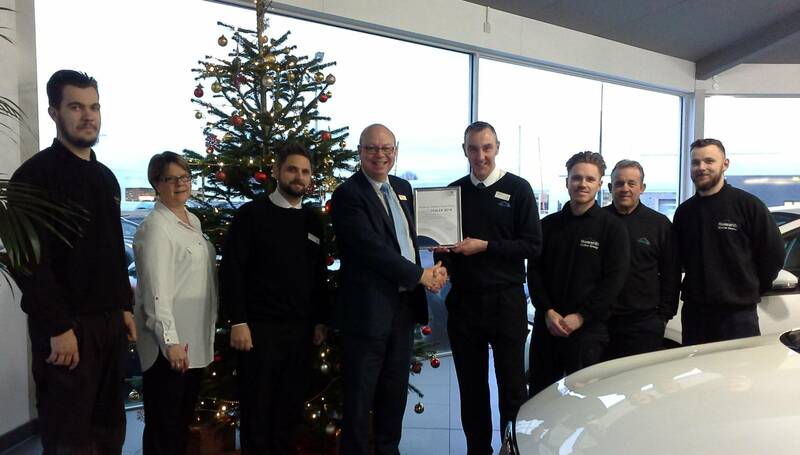 HOWARDS PEUGEOT WESTON-SUPER-MARE ACHIEVE HIGHEST UK SCORE FOR PRO2ACE ACCREDITATION WITH PEUGEOT UK. The ceremony took place at Howards’ Peugeot WSM showroom on the 11th December 2018. Howards Peugeot Service Department worked with the After Sales experts from Peugeot UK. As part of a global programme by the PSA Group, started in 2015, it involves consultancy, coaching and training over a 12 month period. The accreditation confirmed their advanced levels of After Sales processes and customer experience. The team have achieved the highest recorded score in the UK, with 98.1%. The score encompasses all elements of the customer journey process. From vehicle drop off to vehicle collection, the Peugeot WSM scored highly at every stage. Also included, Dealer Operations standards. Pictured, the certificate was presented to the team by Martin Nichols of Peugeot UK. All team members were present at the ceremony, including: Dave John, Mark Holloway, Jane Kent, Dan Cook, Dan Emmery, Rikki Scarrett and Richard Loach. We would like to say well done to the team at Howards Peugeot WSM. Congratulations on this impressive achievement. Keep up all the amazing work that you do! To get in touch with our Howards Peugeot WSM dealership, contact the team directly at our Weston-Super-Mare site.